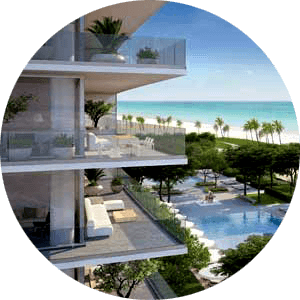 Located on the Surfside 300 linear feet beachfront, Fendi Chateau, a boutique luxury condo complex. Fendi, a first-ever brands condo complex delivers the ultimate luxury beachfront lifestyle. Please Contact Us or give us a CALL 786-505-4786 if you have a question on available residences for sale. With the turquoise oceanfront at 9349 Collins Ave in Surfside FL, apartments feature luxury throughout the building and the residences. Spacious beachfront building feature 58 individual residences in a 12 stories complex. A new construction complex delivers top-notch amenities and full resort services. Chateau Group, LLC operates as a real estate development company in the United States and South America. Its portfolio includes residential, commercial, and mixed-use projects, as well as retail shopping centers. The company was incorporated in 2005 and is based in Hallandale Beach, Florida. Previous developments include 900 Biscayne Bay Residences located across from the American Airlines Arena in Downtown Miami, with adjacent land for future development. Recently completed Chateau Beach Residences in Sunny Isles. Its portfolio includes prime locations for additional development throughout South Florida. Residences range in size from spacious 3,300 to more than 7,000 square feet of living space under AC. 300 linear feet of oceanfront, Fendi Condos boast 10-foot ceilings, sweeping views of the ocean and city from glass railed terraces. Equipped with Fendi Casa Kitchens, custom FENDI casa cabinets with Gaggenau appliances. Summer kitchens in corner residences. All units boast finished bathrooms featuring Italian marble and custom fixtures, along with staff quarters and laundry areas, which includes a full bathroom. The design sensibility that has made Fendi a sought-after brand for nearly a century is evident in the residences. Defined by an unwavering passion for creativity and high quality, these condos combine function and fashion on a grand scale. Located minutes to famous Bal Harbour Shops and a short drive to Miami. Luxury amenities and features, full-service condo complex, Fendi offers a fresh new take on beachfront resort style of living. A lot of thought and design efforts went into incorporating some of these luxury amenities into Fendi Chateau complex. A true luxury resort style living the brand has a proven track for luxury and service. Once you look through what Fendi Chateau condos have to offer you will appreciate what you are getting for your money. Fendi Chateau is offering a unique beachfront luxury lifestyle. Spacious condo units for sale feature flow-through design floor plans with east and west exposure. Starting with 3 bedrooms to luxury penthouses units feature 3300 square feet of living space and large glass railing balconies. All apartments offer direct ocean views and floor to ceiling glass walls. Combine any two units to create your own penthouse. The building has become a new landmark in Surfside bring buyers from around the world to enjoy this unique residence. Give us a call 786-505-4786 if you have an interest or a question regarding the available Fendi residences.